ThatGalJenna: Mani Monday - Too Fancy Lacquer Review - Sweet & Sour and Macklemore! 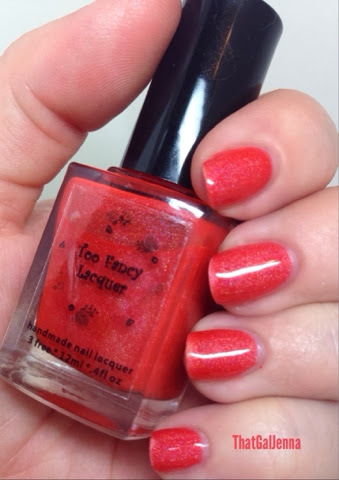 Mani Monday - Too Fancy Lacquer Review - Sweet & Sour and Macklemore! How ya doing this fine Monday morning? Can you believe it's nearly Thanksgiving? 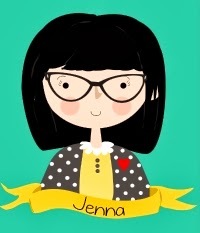 In a few short months I'll be celebrating my 1 year wedding anniversary! Crazy...I feel like I JUST got married. Did any of you watch the American Music Awards last night? What did you think? Not that this is surprising but my goodness Justin Timberlake's performance was awesome! Speaking of Macklemore...the live show we went to on Saturday was AMAZING. 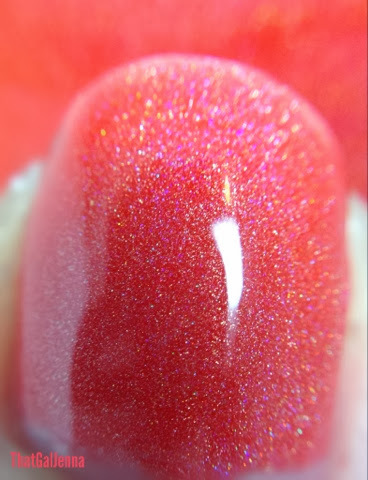 I took a couple videos and have one at the end of this mani post if you want to see it! I don't have AS many photos as I normally do because my camera had a heck of a time focusing on this beauty. It was SO shiny and rich that it made my camera work over time. It's a stunning and unique shade. It's not orange and it's not pink...it's more along the coral lines. The beautiful purple/pink specs in it really bring it to life. LOOK AT THAT MACRO!! Too Fancy Lacquer is having a restock today so make sure to stop by! She has some beautiful new stunners coming to the shop today. I tried my best to mirror their CD in mani form! Here's a nearly 7 minute video from Saturday. I apologize I turned the damn phone sideways half way through so you may have to suffer through that but there's a beautiful pre-song talk and then Same Love. Again...such an awesome day!